Yes we do need everybody’s approval — especially in order to proceed with something new or scary. We are humans, and humans are social creatures. Back when we were cave people, it was downright dangerous to get excluded by the other members of the tribe — it left us vulnerable to getting attacked by saber-tooth tigers and cave bears, getting lost, and getting only the tough, leftover bits of mammoth meat. Caring about what others think is deep in our cellular memory. 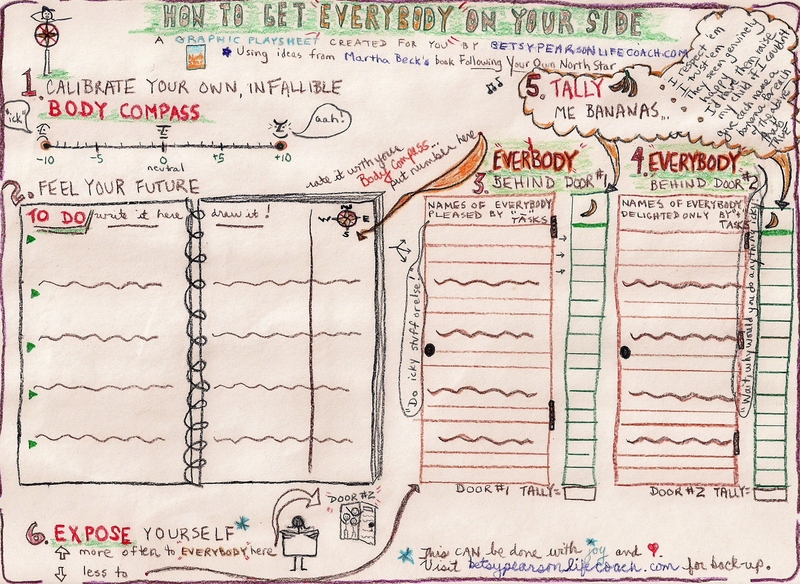 As Martha Beck points out in Finding Your Own North Star, we can’t succeed in not caring what other people think (only sociopaths can do that), but we can choose who we see as our generalized other — our “Everybody.” Here’s a worksheet for doing just that — a hybrid of several of Beck’s tools — along with a description of how to use it (allot about 20 minutes). A file is available here for downloading and printing the worksheet. Imagine a linear scale running from -10 to +10, describing your happiness and well-being. At the extremes, -10 is when you feel awful, and a +10 is when you feel wonderful. In the middle at zero is a rather neutral state of being. a. Remember a fairly bad memory, something on the order of a -8 (no need to revisit total despair!). Close your eyes, relive the bad time, AND notice exactly what you feel in your body. I don’t mean emotions like sadness, fear, or anger, but rather sensations such as tightness, heaviness, heat/cold, numbness, or pain. Where in your body do you feel what? I want you to be able to remember this state without having to relive it, so assign this cluster of sensations a nickname like “ick” or “the burning weight” or whatever captures the fundamental tone. b. Open your eyes, stand up for a minute, and let that ickiness go. Shake both hands, arms, legs. Take a deep breath in and release the unpleasantness as you exhale. c. Now remember a wonderful time. A full on +10. It could be a brief second or a whole era. If you find it hard to recall a good memory right after a bad one, no problem — pretend you are breathing perfectly fresh air under a sunny, blue sky. Note each body sensation. As before, name this sensory experience (something like “ahh…” or “lightness”) so you have a personal shorthand for the physical sensation of joy. a. In the first column of the worksheet, write a To-Do list — six tasks you’ve planned for the next few days. b. For each task on the list, close your eyes, and imagine you’re doing the task. At the same time, notice your body sensations. Rank that feeling with your Body Compass. Take some time. Really FEEL each task — then write the Body Compass reading in the second column. Write their names in the fourth column: Everybody Behind Door #2. If you don’t have many positive tasks, don’t worry – your life will FILL with more and more delight-filled activities as you start to get Everybody on your side! ~ If I were unable to raise my own child/pet, I would love for this person to do it. Tabulate the number of smiley faces. ~ Consider the people with the most smiley faces: I am guessing they are living freely, finding their own heart’s desires, and therefore are free to see the world as it is; to see the real you, love you, and be all-for whatever your heart desires! And I am guessing they are the people behind Door #2. ~ Consider those with the least number of smiley faces. I am guessing they are NOT living the dream and — consciously or not, and perhaps for well-intentioned but misguided reasons — they want others to live as shackled as they are. Usually these folks reside behind Door #1. 6. Increase exposure to Everybody Behind Door #2, and decrease exposure to Everybody Behind Door #1. Reminders of Everybody – Pictures of them, mementos, gifts they gave you.. anything that conjures up their energy. Add more and more of those from behind Door #2 and decrease those from behind Door #1. Seek out people behind Door #2. Just say no to Door #1. With Everybody’s approval, it’s much easier to live as your heart’s desire. And that’s good for you AND all the Everybodies in the whole world. This entry was posted in "Everybody", Body Compass, Thought work, Worksheets. Bookmark the permalink.